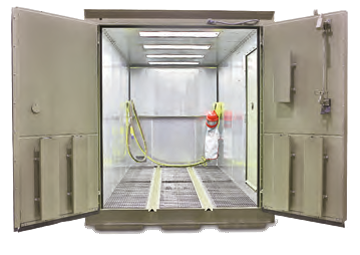 Pre-assembled blast rooms from Clemco Industries arrive ready-to-install and include area recovery (either pneumatic with cyclone separator or mechanical with air-wash abrasive cleaner), bright lights to enhance visibility, full-size door and control panel. Just connect components and add power and air for a quick set up. The option of recovery or full room dust collection, the number of room operators, air wash or cyclonic media reclaim system, blast suit and respirator can all be chosen based on user specifications. Pre-assembled blast rooms are made of a strong steel floor with grating that’s a half inch thick, a 16 gauge ceiling, 10 gauge walls and equipped full height and width work doors. The systems are offered for many types of media – harsh and aggressive, light or heavy media, steel shot or glass beads. Blast rooms can be installed in a pit to make level with current floor levels, or placed on a smooth, even surface with a ramp for simpler site preparation. If the pre-assembled room doesn't suit your needs, if you require just a recovery system for your existing blast room, or maybe an entire blast room or dry-stripping room of any size, HTE Abrasive Blast Solutions, together with Clemco, will help you plan and then budget and install a blast facility that reflects the latest technological advances in blasting. Once installed, we will remain on-site to ensure that your employees know how to operate and maintain it. HTE Abrasive Blast Solutions is dedicated to providing the resources Kansas, Missouri and Illinois manufacturers need to maximize the return on their blast room investment.